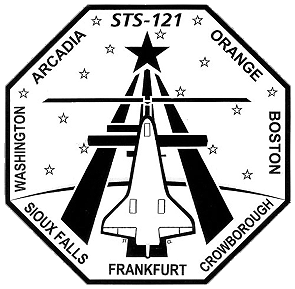 The STS-121 (ISS ULF-1.1) test flight mission was originally to be flown aboard Atlantis in September 2005, after Space Shuttle Discovery flew STS-114, but a problem with the landing gear of Atlantis moved Discovery ahead to fly STS-121. 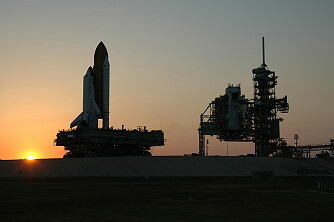 After the return of Discovery to California following the completion of STS-114, scheduling again changed. 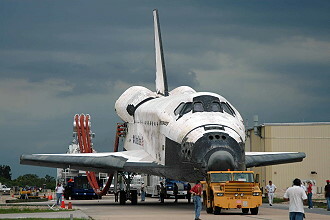 Atlantis was moved up to fly the STS-115 mission (whose launch was planned for August 2006) and Discovery was to fly the STS-121 mission as originally planned. 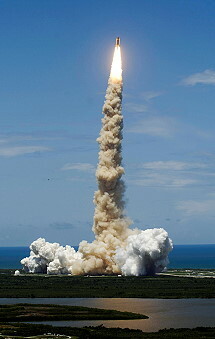 The launch of the STS-121 mission was delayed until July 2006 as well, due to an unresolved foam debris and the Engine Cut Off (ECO) sensor issue from STS-114. The launch was delayed twice due to bad unacceptable weather. 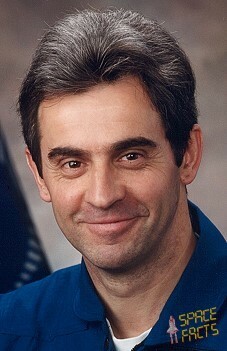 Thomas Reiter's position was previously planned to be filled by Sergei Volkov before the launch of STS-121 was postponed until July 2006. Astronaut Piers Sellers replaced Carlos Noriega who was originally scheduled to be on the STS-121 mission NASA announced on July 15, 2004. This was due to an undisclosed, temporary medical condition. After the Columbia accident, NASA decided that two test flights would be required and that activities that were originally assigned to STS-114 would need to be divided into two missions because of the addition of post Columbia safety tests. 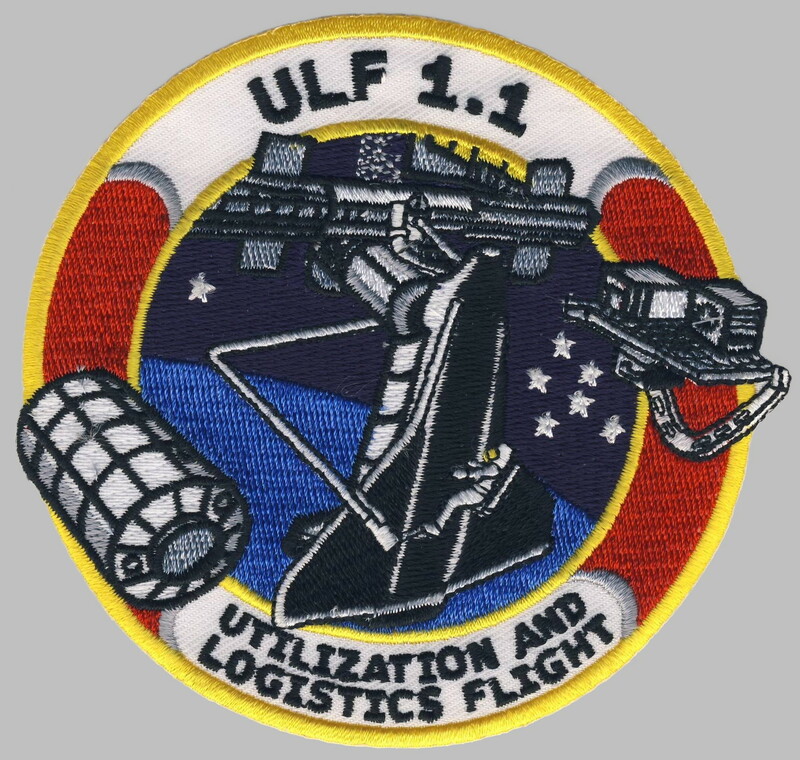 The main purposes of the mission were to test new safety and repair techniques introduced following the Columbia disaster of February 2003 as well as to deliver supplies, equipment. . Discovery delivered with ESA astronaut Thomas Reiter a third crew member to live aboard the station as part of Expedition 13. 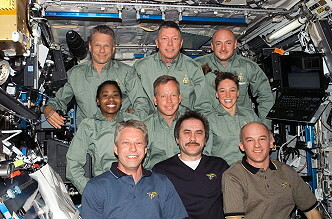 It was the first time a three-person crew resides on station for a long duration since the Expedition 6 crew returned to Earth May 04, 2003, in Kazakhstan. 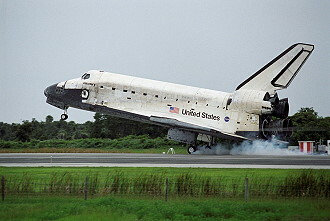 Without the space shuttle to ferry equipment to the station after the Columbia accident, only two people could be supported onboard until the necessary provisions were in place. To help deliver tons of supplies, Discovery carried an Italian-built pressurized cargo container called Leonardo, in its cargo bay. During and after launch much attention was paid to monitoring the external tank for the loss of insulation foam. The shuttle was equipped with a number of new cameras, and video was also taken from spotter planes. Each solid rocket booster contained three cameras - one to monitor the separation, and two focused on the leading edge. The video from these was not to be broadcast, but recorded for later retrieval from the solid rocket boosters. A further camera was placed on the external tank, as during STS-114, to broadcast live images on NASA TV during launch. The first thing two of the crew from the mid-deck did when the main engines cut out were leave their seats to take photographs and video of the external tank. One of the factors that were potentially affecting the choice of day within the launch window was the lighting conditions for this imagery, as the sun's slightly different angle on the different days affected the location of shadows on the external tank. However, the day to day difference in lighting was determined to be relatively unimportant, particularly as the lighting conditions depended to a great degree on a more unpredictable factor - the degree to which the external tank tumbles on separation. During the launch, NASA TV broadcast a view from the external tank camera mounted between the Shuttle and the external tank. Unlike the previous two missions, no foam breakage or foam pieces were easily seen falling off the tank. However, upon close inspection of the many cameras covering the launch NASA has revealed several small pieces of debris were seen jetting away from the tank. Generally, though, these were seen after the time NASA was most concerned about. About 23 minutes into the flight, further debris was observed floating beside the orbiter as reported by Mission Specialist Michael Fossum. His transmission was broadcast live on NASA TV. Michael Fossum initially described the debris as a 4-5-foot-long (1.2-1.5 m) piece with straps attached, a description which would fit a thermal protection system blanket. Such a blanket was noted to be flapping on the previous mission, STS-114, but was not of concern, as it protects a section of the vehicle which does not get particularly hot. Analysis of video images on the ground has indicated that the debris observed was strips of ice formed on the outside of an engine nozzle, which sublimated and disintegrated during observation. Very similar ice formations were seen on earlier missions. The post mission management team briefing after flight day 2 revealed that the inspections had found that a gap filler was protruding on the port side lower wing, not a location of particular concern. 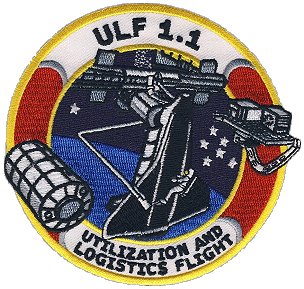 The gap filler was not from an area which has been modified since STS-114; it had been with the vehicle since 1982. 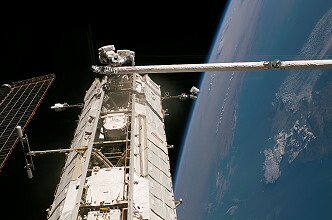 The height and location of the gap filler was to be investigated further and, if necessary, dealt with using the procedure established and proven by STS-114, during a spacewalk. 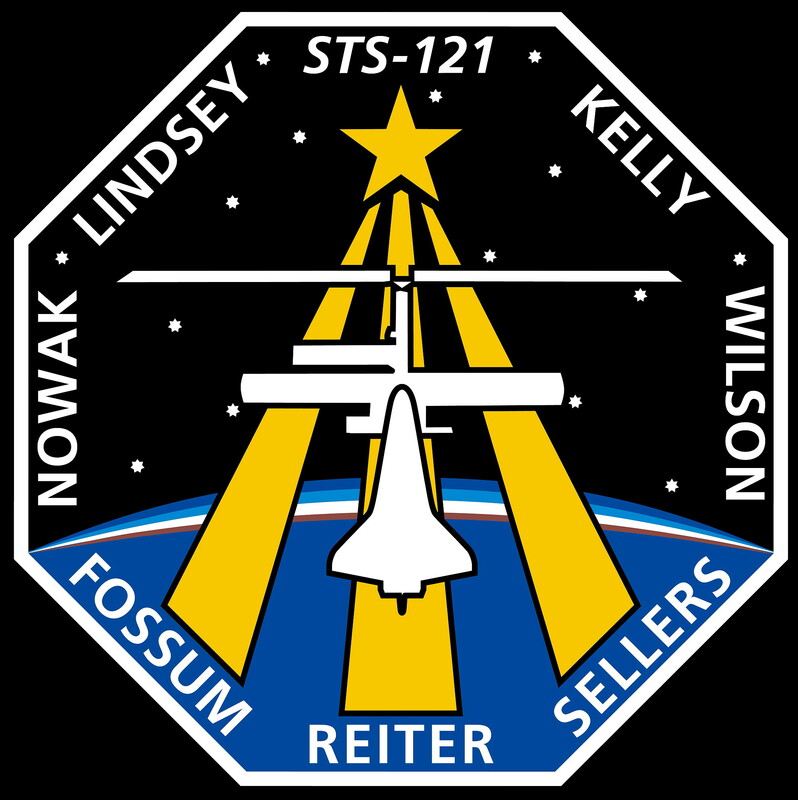 Discovery's approach to the International Space Station during the STS-121 rendezvous and docking process included a tricky maneuver first demonstrated on STS-114. The orbiter was commanded to conduct a back flip, enabling station crew members to take digital, images of the shuttle's heat shield. With Commander Steven Lindsey at the controls, Discovery performed the 360-degree pitch-around maneuver with the orbiter about 600 feet (182.9 meters) below the station. The flip took about nine minutes to complete, offering Expedition 13 Commander Pavel Vinogradov and Flight Engineer Jeffrey Williams time photograph tile surface imagery of Discovery. The photos were then downlinked through the station's Ku-band communications system for analysis by systems engineers and mission managers. The photos were taken out of windows 6 and 7 in the Zvezda service module with Kodak DCS 760 digital cameras and 400 mm and 800 mm lenses. The imagery during the R-bar Pitch Maneuver (RPM) were among several inspection procedures instituted after the Columbia accident designed to detect and determine the extent of any damage the orbiter's protective tiles and reinforced carbon-carbon surfaces might have sustained. The sequence of events that brings Discovery to its docking with the station began with the precisely timed launch of the shuttle, placing the orbiter on the correct trajectory and course for its two-day chase to arrive at the station. During the first two days of the mission, periodic engine firings gradually brought Discovery to a point about 9 ½ miles (24.6 km) behind the station, the starting point for a final approach. 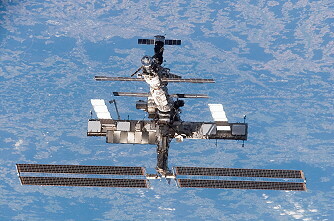 About 2 ½ hours before the scheduled docking time on flight day 3, Discovery reached that point, about 50,000 feet (15,240 meters) behind the ISS. There, Discovery's jets were fired in a terminal initiation (TI) burn to begin the final phase of the rendezvous. Discovery closed the final miles to the station during the next orbit. 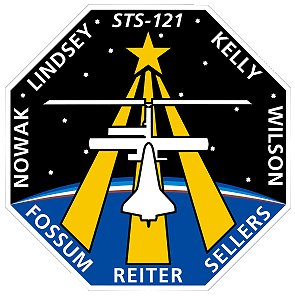 As Discovery moved closer to the station, the shuttle's rendezvous radar system and trajectory control sensor (TCS) began tracking the complex, and providing range and closing rate information to the crew. During the final approach, Discovery executed several small mid-course corrections at regular intervals with its steering jets. That placed Discovery at a point about 1,000 feet (304.8 meters) directly below the station where Steven Lindsey took over the manual flying of the shuttle up the R-Bar, or radial vector toward the complex, the imaginary line drawn between the station and the Earth. He slowed Discovery's approach and flew to a point about 600 feet (182.9 meters) directly below the station, and if required, waited for the proper lighting conditions. The rendezvous was designed to optimize lighting for inspection imagery as well as crew visibility for critical rendezvous events. On verbal cue from Pilot Mark Kelly to alert the station crew, Steven Lindsey commanded Discovery to begin a nose-forward, three-quarter of a degree per second rotational back flip. At R-bar Pitch Maneuver (RPM) start, the ISS crew began of series of photographs for inspection. The sequence of photography mapping provided optimization of the lighting conditions. Both the 400 and 800 mm digital camera lenses were used to photograph the required surfaces of the orbiter. The 400 mm lens provided up to 3 inch (7.6 centimeters) resolution and the 800 could provide up to 1 inch (2.5 centimeters) resolution as well as detect gap filler protrusions of greater than .25 inch (6.4 mm). The imagery included the upper surfaces of the shuttle as well as Discovery's belly, nose landing gear door seals, the main landing gear door seals and the elevon cove with 1 inch analytical resolution. 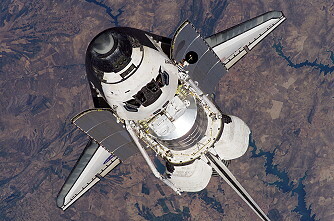 Since the STS-114 mission, additional zones were added for the 800 mm lens to focus on the gap fillers on Discovery's belly when the orbiter was at 145 and 230 degree angles during the flip. There was enough time for two sets of pictures. When Discovery completed its rotation, it returned to an orientation with its payload bay facing the station. Steven Lindsey then moved Discovery to a position about 400 feet (121.9 meters) in front of the station along the V-Bar, or the velocity vector, the direction of travel for both spacecraft. Mark Kelly provided Steven Lindsey with navigation information as he slowly inched the shuttle toward the docking port at the forward end of the station's Destiny Laboratory. Mission specialists Lisa Nowak and Stephanie Wilson also played key roles in the rendezvous. They operated laptop computers processing the navigational data, the laser range systems and Discovery's docking mechanism. Using a view from a camera mounted in the center of Discovery's docking mechanism as a key alignment aid, Steven Lindsey precisely aligned the docking ports of the two spacecraft. He flew to a point where the docking mechanisms were 30 feet (9.14 meters) apart and paused to check the alignment. 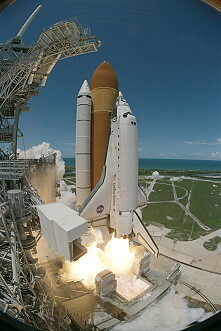 For Discovery's docking on July 06, 2006, Steven Lindsey maintained the shuttle's speed relative to the station at about one-tenth of a foot per second (3 centimeters per second) (while both Discovery and the station were traveling at about 17,500 mph = 28,163 km/h), and kept the docking mechanisms aligned to within a tolerance of three inches (7.6 centimeters). When Discovery made contact with the station, preliminary latches automatically attached the two spacecraft. Immediately after Discovery docked, the shuttle's steering jets were deactivated to reduce the forces acting at the docking interface. Shock-absorber-like springs in the docking mechanism dampened any relative motion between the shuttle and the station. Once that motion between the spacecraft had stopped, Stephanie Wilson secured the docking mechanism, sending commands for Discovery's docking ring to retract and to close a final set of latches between the two vehicles. 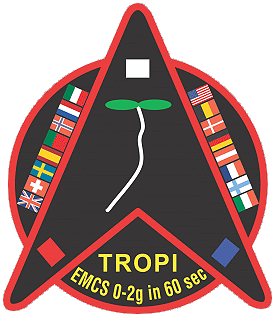 The docking set the stage for the opening of the hatches and the start of joint operations, including the transition of Thomas Reiter to the Expedition 13.
International Space Station Flight Engineer Thomas Reiter, representing the European Space Agency (ESA), flew to the space station aboard Discovery. He had to lead the transfer of supplies from the shuttle's cargo module to the space station during the spacewalks and he assisted with suit-up prior to the spacewalks. He was conducting his second long-duration spaceflight mission. He spent 179 days in space in 1995-1996 on a mission to the Russian MIR space station during which he conducted two spacewalks and about 40 European scientific experiments. Thomas Reiter was the first ESA astronaut to live aboard the International Space Station for a long-term mission. Thomas Reiter worked on the station as part of an agreement between the Russian Federal Space Agency and ESA. 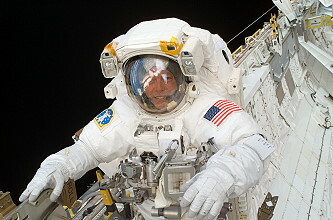 Thomas Reiter remained on the space station until the STS-116 space shuttle. The Leonardo cargo carrier housed in Discovery's payload bay was berthed to the space station Unity module's Earth-facing port on flight day 4. This was the fourth trip to the station for Leonardo, the first of three such Italian-built cargo carriers to be put into service. 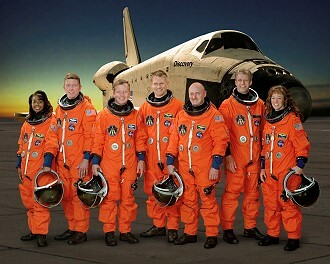 Leonardo flew to space for the first time aboard Discovery during STS-102 in February 2001. - 80 °C Freezer. This freezer is known as the Minus Eighty Degree Laboratory Freezer for ISS (MELFI). The French built unit comprises four independent drawers which can be set to operate at different temperatures. 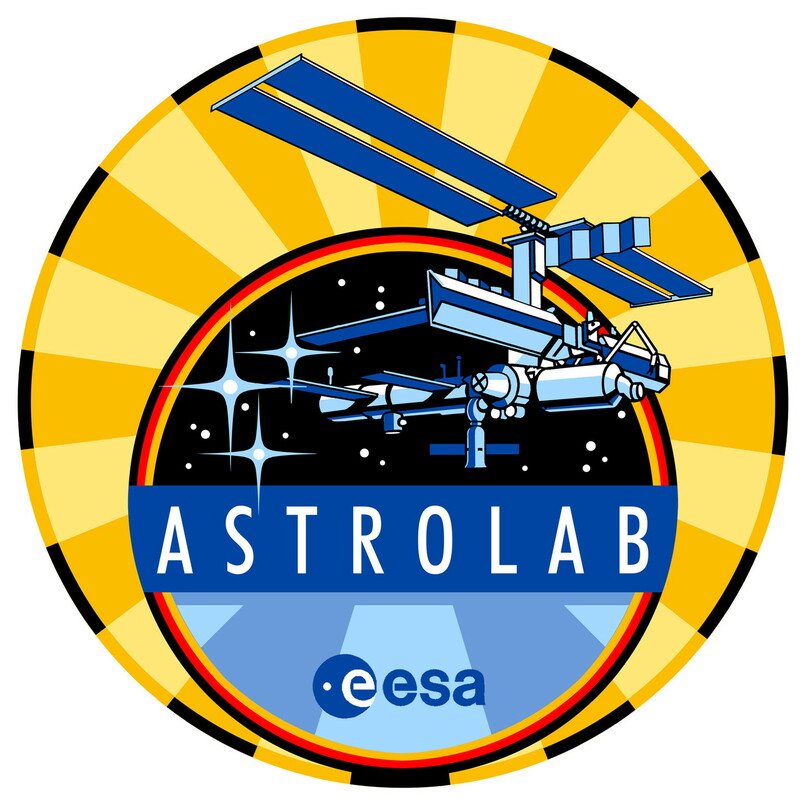 Initially, temperatures of -80 °C, -26 °C, and +4 °C will be used during on-orbit ISS operations. Both reagents and samples will be stored in the freezer. As well as storage, the freezer is designed to be used to transport samples to and from the ISS in a temperature controlled environment. The total capacity of the unit is 300 liters. - The European Modular Cultivation System (EMCS) for biological experiments. This consists of a gas tight incubator in which there are two centrifuges, each able to carry four experimental cartridges. Two "Ground controls" - exact copies of the equipment and experiments - will be run on the ground, one in Europe and one at NASA's Ames Research Center. - New oxygen generation system. This device is considered a test for an equipment design with potential for use on proposed future long durations to the Moon and Mars. The system will initially run below its maximum capacity, though it is designed for enabling the ISS to support a crew of six in the future. It will supplement the Russian-built Elektron system operating in the Zvezda module. - New cycling machine for the ISS crew. A Danish built device, the Cycle Ergometer with Vibration Isolation System (CEVIS). - Replacement common cabin air assembly heat exchanger used to control the internal air temperature of the ISS. Also carried in the payload bay: an Integrated Cargo Carrier with the Trailing Umbilical System (TUS) for the Mobile Transporter (returning old one); an EATCS/Pump Module (PM); and 2 Fixed Grapple Bars for PM & TUS relocation during EVA, as well as an LMC carrying the DTO-848 TPS Repair Box. The first EVA was performed by Piers Sellers and Michael Fossum on July 08, 2006 (7h 31m) for maintenance on the stations mobile transporter and a test of astronaut movement on the end of the robotic arm boom extension for possible heat shield repairs during future flights. During the first spacewalk, the crew members tested the 50-foot robotic arm boom extension, usually used for remote shuttle thermal protection system (TPS) inspections, as a potential work platform for hard-to-reach repair sites on the bottom of the orbiter for detailed test objective (DTO) 849. They also began maintenance of the station's mobile transporter (MT) by safing or replacing a cable cutter and routing a cable on the MT to allow it to be moved before the second spacewalk. 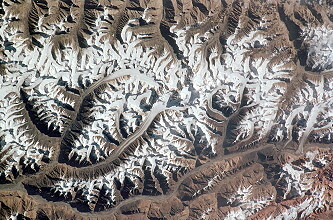 The cable cutter, called an interface umbilical assembly (IUA), is on the top, or zenith side of the MT. A duplicate device on the Earth-facing, or nadir side, of the MT inadvertently cut the nadir cable in December 2005. The crew first worked on keeping the zenith IUA from activating in the future by either installing a device to block the cutter from the cable or remove the IUA and replaced it with a new unit launched on Discovery. The Expedition 12 crew had tried to safe the zenith IUA during a spacewalk in March 2006 by installing a safing bolt, but the bolt could not be inserted. To prevent the cable from being inadvertently cut, that crew removed it from the IUA until the STS-121 crew could work on it. Piers Sellers and Michael Fossum re-routed the Trailing Umbilical System (TUS) cable through the IUA, once it is configured safely, to allow the MT to be moved from worksite 4 (WS4) to worksite 5 (WS5 on the station's truss) in advance of EVA 2. The next objective of the spacewalk, was to test the new robotic boom as an orbiter tile inspection or repair work platform. For the test, first Piers Sellers and then both crew members, worked on the end of the boom. They simulated repair-related movements in at least three different OBSS positions. Sensors installed on the OBSS and imagery from various cameras provided post-flight information to engineers that helped them evaluate the stability of the boom. Much of the test was dedicated to setting up tools and the OBSS for the movements and then reconfiguring at the end. The movements of the spacewalkers for the tests in the three arm positions were scheduled to take about 30 minutes each. The spacewalkers provided comments about each movement, while the sensors in the load cell recorded quantitative data for review following the mission. After leaving the Quest airlock, Piers Sellers and Michael Fossum first safed the zenith IUA as described above. Then they moved to the pressurized mating adapter (PMA) 1 to retrieve an articulating portable foot restraint (APFR) with a tool stanchion (TS). Next they worked their way down to Discovery's payload bay, hand-over-hand to setup for the test. Once in the payload bay, Piers Sellers temporarily placed the APFR/TS on the integrated cargo carrier (ICC) and Michael Fossum configured it. Piers Sellers then continued set up by deploying a sensor, called a load cell or instrumented worksite interface fixture (IWIF), which he installed later on the OBSS. Commander Steven Lindsey used a laptop computer inside Discovery, with an RF antenna installed, to activate the sensor. Lisa Nowak and Stephanie Wilson then moved the shuttle's robotic arm so that the end of the OBSS/SRMS hovers above the starboard sill of the payload bay. There, Piers Sellers installed several safety tethers onto the OBSS. Lisa Nowak and Stephanie Wilson then moved the tip of the OBSS to just above the starboard sill of the payload bay. Piers Sellers installed the activated load cell and a portable foot restraint attachment device (PAD). 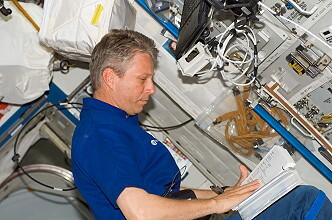 Since this was the first time that crew members interact directly with the OBSS, Michael Fossum was on hand to physically stabilize the OBSS any time Piers Sellers is performing setup and cleanup activities with it. Next, Piers Sellers and Michael Fossum worked together to move the APFR/TS onto the top of the load cell now on the tip of the OBSS. Piers Sellers extended the TS and ingressed the APFR. With setup complete, Lisa Nowak and Stephanie Wilson maneuvered the robotic boom into the first test position, with Piers Sellers riding at the end of the OBSS. Michael Fossum stayed in the payload bay and took digital photos during the first test. For the first position, the end of the boom is about 14 feet (4.3 meters) from the payload bay, directly above the position where Piers Sellers got on the boom. Once the boom was in place, Piers Sellers performed several movements to simulate real inspection or repair actions. The positions simulated movement of a crew member on the tip of the boom during translation to, and while inspecting a potential damage site on the bottom of the orbiter. They included Piers Sellers simulating taking photographs, laying back slightly to retrieve a tool behind him, reaching for equipment in front of him, and making positional changes to the APFR and TS. The second position, where Piers Sellers performed additional movements, had the end of the OBSS extending about 27 feet (8.2 meters) to the port and aft of Discovery's payload bay. This position had the SRMS joints in a slightly "weaker" configuration which should result in larger OBSS deflections. Piers Sellers went through three sets of movements similar to the movements at the first test position. Michael Fossum repositioned himself in the payload bay to watch and document the second round of tests. Once the tests in the first position, and second, were complete, Lisa Nowak and Stephanie Wilson moved the OBSS back to above the sill of the payload bay where Michael Fossum was waiting. There, Piers Sellers moved off the APFR so Michael Fossum could get on. Then Piers Sellers hang onto the TS and both tethered themselves in place. Lisa Nowak and Stephanie Wilson then moved the OBSS into an intermediate position and then the third test position. In the third position the end of the OBSS is 16 feet (4.9 meters) in front of the station's P1 truss segment. The configuration of the SRMS joints provides a similar "weakness" to those of position 2. The main difference was that both crew members were now on the tip of the OBSS. During the position 3 evaluations, Michael Fossum made gestures similar to what Piers Sellers did at the first two positions with Piers Sellers now also on the boom. Both crew members moved simultaneously for some of the test. Once the movements at the third test position were complete, Lisa Nowak and Stephanie Wilson moved the end of the OBSS with both Michael Fossum and Piers Sellers toward the station's P1 truss segment for the final set of tests. At this test position Michael Fossum simulated repair movements on the P1 truss structure. 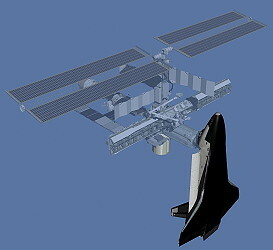 The P1 truss was selected to represent a TPS damage location somewhere on the orbiter that would need repair. This specific location was chosen because of the SRMS joints that are necessary to reach it. Once again, the joints provide a "weak" configuration that allows for larger OBSS tip deflections. The data resulting from using a "weaker" configuration were expected to provide the best information in order to gauge the capability of performing a real repair from the OBSS. The movements performed by Michael Fossum simulated applying tile repair material with an emittance wash applicator (EWA), drilling on an RCC panel, and using a spatula with repair material on an RCC panel. Once the testing was done in the final OBSS position, Lisa Nowak and Stephanie Wilson moved the arm so the spacewalkers could egress onto Discovery's payload bay sill. With Michael Fossum's assistance, Piers Sellers had to cleanup the end of the OBSS by removing the APFR/TS, load cell, PAD and safety tethers. The equipment was taken back to the airlock with the spacewalkers. Once the OBSS was reconfigured, the arm was moved higher above the payload bay out of the way. The second EVA by Piers Sellers and Michael Fossum occurred on July 10, 2006 (6h 47m) for installation of a spare thermal control system pump on to the outside of the Quest Airlock and replacement of reel assembly for a cable that provides power and data to the stations mobile transporter. The second EVA consisted of installing the thermal control system's spare pump module and replacing the nadir Trailing Umbilical System - Reel Assembly (TUS-RA). The TUS provides power, data and video to the MT. During EVA 1, the crew re-routed the zenith TUS cable thru the zenith IUA to allow the TUS to be moved from position WS4 to WS5. Before EVA 2, the MT must be moved from WS4 to WS5 because its current position makes it difficult for the crew to change out the nadir TUS-RA. At the start of EVA 2, both crew members translated down to the payload bay and prepared the pump module for transfer. The first activity was for Michael Fossum and Piers Sellers to take the fixed grapple bar (FGB) from the underside of the ICC and install it onto the pump module. The FGB allowed Lisa Nowak and Stephanie Wilson to latch onto the pump module with the station's robotic arm and moved it to the worksite at the external stowage platform 2 (ESP 2) for installation. Once the FGB was installed, the crew released the pump module from the ICC and lifted it up to present it to the robotic arm. During the arm's maneuver, Piers Sellers and Michael Fossum began preparation for removing and replacing the TUS-RA. First, they prepared the payload bay by relocating some APFRs and opening the TUS multi-layer insulation (MLI) cover. Then, they translated to the starboard zero (S0) truss segment, located above the Destiny Lab. Michael Fossum prepared the old TUS-RA for removal by releasing electrical connectors and bolts, while Piers Sellers changed out the nadir IUA in preparation for routing the new TUS cable. Once complete, they both translated to ESP 2 to install the pump module. Lisa Nowak and Stephanie Wilson presented the pump module with the robotic arm. Once Piers Sellers and Michael Fossum had a hold, the arm released it and moved away so the pump module could be set on ESP 2 and bolted in place. Next, Michael Fossum configured the robotic arm with an APFR and, along with Piers Sellers, released and removed the old TUS from S0. Michael Fossum, now mounted on the robotic arm, was maneuvered down to the payload bay. Because this maneuver took some time, Piers Sellers translated to the payload bay and finished preparation tasks for removal of the new TUS-RA. Once both were ready, Piers Sellers got into an APFR on the ICC and Michael Fossum handed Piers Sellers the old TUS-RA. Michael Fossum then maneuvered to the new TUS-RA, removed it from its launch location and returned to Piers Sellers to swap the 330-pound (150 kg) TUS-RAs. Michael Fossum handed Piers Sellers the new TUS-RA - Piers Sellers had a one in each hand - and then Piers Sellers handed Michael Fossum the old TUS-RA. Michael Fossum put the old reel assembly on the carrier and retrieved the new one from Piers Sellers. Michael Fossum, who was still on the end of the robotic arm, took the new TUS-RA and began to maneuver up to S0 to install it. Piers Sellers completed installation of the old TUS onto its stowage location with the flight support equipment, and then translated back up to S0. Together they installed the new TUS-RA into S0 and routed the new cable to the nadir IUA. With the EVA complete, there were both a zenith and nadir TUS, assuring redundancy for operation of the Mobile Transporter. The third and final EVA by Piers Sellers and Michael Fossum was conducted on July 12, 2006 (7h 11m) to demonstrate on orbit heat shield repair techniques. After leaving Quest, Piers Sellers and Michael Fossum had to setup tools on the end of the station's robotic arm, Canadarm2. 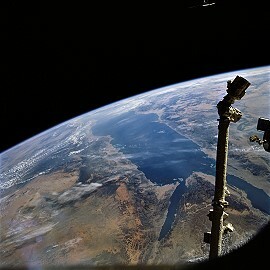 Piers Sellers installed an APFR on the end of Canadarm2. Michael Fossum handed him supplies and tools to attach, including a CRM bag and an Infrared camera. Piers Sellers used the infrared (IR) camera as part of DTO 851 to take about 20 seconds of IR video of RCC panels on Discovery's wing leading edge while being transported on the end of Canadarm2 to Discovery's payload bay. The FLIR Systems ThermaCAM S60 Infrared Camera is being assessed as a way to inspect RCC for damage on-orbit. Depending on how far away the crew member is, the camera's field of view can cover 52 inches (132 centimeters), or about two RCC panels, to 83 feet (25.3 meters) , the entire wing leading edge at a time. The camera can record temperature variances from minus 400-degrees Celsius to 1,200-degrees Celsius. The video is recorded at a 0.6 Hz frame rate and is saved on internal memory and then transferred to a memory card. Meanwhile, Michael Fossum travelled hand-over-hand to the cargo bay and began setting up the worksite. The two worked side-by-side to test repair techniques on a pallet of pre-damaged RCC samples. The pallet included twelve RCC samples. Eight had various sized cracks and/or gouges, two were blank slates or "palettes" to be used during repairs of the other samples, and two were pre-damaged samples to be imaged with the IR camera. There were more samples for the crew members to work with than what is required or expected to be completed. The pallet was located in the aft portion of Discovery's cargo bay. Michael Fossum had to setup another APFR to position himself next to the pallet and opened the pallet's lid. Once in the cargo bay, Piers Sellers got off the robotic arm to attach the CRM bag to the inside of the pallet's lid and then got back on the arm to begin the repair work. The RCC crack repair tasks for DTO 848 involved using a pre-ceramic polymer sealant impregnated with carbon-silicon carbide powder, together known as NOAX (short for non-oxide adhesive experimental). The NOAX material is temperature sensitive and the ideal condition for the repairs is when the samples are between 100 and 35 degrees Fahrenheit, with the temperature decreasing. Therefore the crew members were scheduled to work on the crack repairs with the NOAX material during night portions of their orbit, beginning the repair just after orbital sunset. Once setup for the spacewalk was complete, if the temperature readings were acceptable, the crew began repairing a cracked or gouged RCC sample. For the tests, Michael Fossum assisted Piers Sellers as he used a space-hardened caulk gun to dispense the NOAX material. Using one of three manual caulk guns in the crack repair kit, he dispensed the material directly onto the sample. He then used one of many spatulas, similar to a putty knife, to work the crack repair material into the pre-damaged RCC sample mounted in the DTO pallet. Additional layers then were added to the repair by first extruding the material onto the nearby RCC palettes. He then used the spatula to manipulate the material onto the sample being repaired. Piers Sellers and Michael Fossum continued repairing the remaining cracked samples with the NOAX material. If at least the two highest priority RCC impact damage samples had been repaired, there was an additional task for DTO 851 for the crew to complete. It involved taking about 60 seconds of video with the IR camera of two damaged RCC samples on the pallet. Piers Sellers used the IR camera to record a temperature gradient throughout each RCC sample itself. As with the actual RCC repair tasks, it was preferred that the temperature is dropping. Therefore, the best imaging occurred by Piers Sellers starting the imaging during direct sunlight and then about 10 seconds later he shaded the samples to provide the desired temperature gradient. 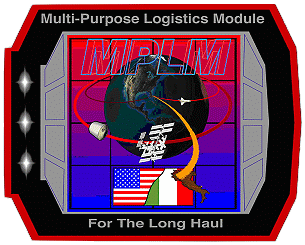 The astronauts also continued cargo transfers between the shuttle, the International Space Station and the Leonardo multi-purpose logistics module. Leonardo arrived with more than 7,400 pounds (3,357 kg) of equipment and supplies for the station. Leonardo was returned to the payload bay packed with more than 4,300 pounds (1,950 kg) of science experiment results, unneeded items and trash. 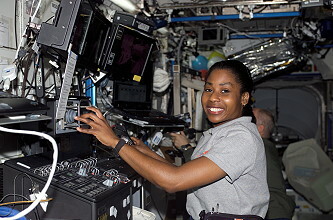 Before undocking crew members also used the robotic arm and the orbital boom sensor system to perform final inspections of the starboard wing and shuttle nosecap for any damage that may have been caused by orbital debris while docked with the International Space Station. Troubleshooting of one of the Flash Evaporator Subsystem (FES) (FES PRI B) was carried out, 'A' would be used during reentry but it is desirable to have both functional. This was in addition to the usual extensive "checkout" of all those systems required for reentry ensuring they were functional. The main area of concern was APU-1, tests on APU-1 also increased confidence in its integrity to the point where mission controllers decided to use the unit as normal for the re-entry. Once Discovery was ready to undock, Stephanie Wilson sent a command to release the docking mechanism. At initial separation of the spacecraft, springs in the docking mechanism pushed the shuttle away from the station. Discovery's steering jets were shut off to avoid any inadvertent firings during the initial separation. Once Discovery was about two feet (61 centimeters) from the station, with the docking devices clear of one another, Mark Kelly turned the steering jets back on and fired them to very slowly move away. From the aft flight deck, Mark Kelly manually controlled Discovery within a tight corridor as the orbiter separated from the station, essentially the reverse of the task performed by Steven Lindsey just before Discovery docked. Discovery continued away to a distance of about 450 feet (137.2 meters), where Mark Kelly initiated the first of two separation burns to fly the shuttle above the station. A full flyaround of the station was no planned to conserve time for further inspections of Discovery's heat shield. 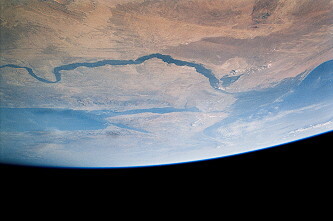 Once directly above the station, Mark Kelly fired Discovery's jets to leave the station area. Discovery held station keep at a distance of 40 nautical miles (74 km) from ISS until the late inspection imagery was reviewed and the Mission Management Team cleared the orbiter for landing. This position allowed Discovery the opportunity to redock to the station if needed. Thomas Reiter landed on December 22, 2006 at22:31:58 UTC with STS-116.